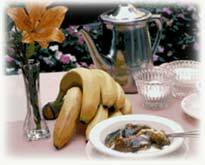 In 1951, Chef Paul created Bananas Foster. The scrumptious dessert was named for Richard Foster, who, as chairman, served with Owen on the New Orleans Crime Commission, a civic effort to clean up the French Quarter. Richard Foster, owner of the Foster Awning Company, was a frequent customer of and a very good friend of Owen. Little did anyone realize that Bananas Foster would become an international favorite and is the most requested item on the restaurant's menu. 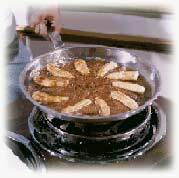 Thirty-five thousand pounds of bananas are flamed each year at in the preparation of its world-famous dessert.